A blueprint has been laid out. A bounty has been set. But we’re not really bounty hunters, unless you count capturing the internet from the old power and sharing it with the new. We’re more like architects, building the cyber pyramids that will last forever, and we might just need help from the extraterrestrial among us. So if you can help, join us, because we want to include you. Time is up on the old internet. We’re mobilizing, and no border is going to stop us. 1. Completed the upgrade of the main chain and wallet on May 3rd to improve wallet transaction performance. 2. Completed the main chain RPC interface reconfiguration, completed the client connection to the new RPC interface, sorted the P2P message flow and added the memo type to the transaction. Debugged and joint tested main chain, side chain, arbitrator node and merged mining. 3. The development of the SPV node is complete and is compatible with the Bitcoin interface. It is planned to be released by the end of May to support the integration of exchange and wallets. Updated SPV SDK interface, design and wrote SPV node RPC interface. 4. Development of mobile wallet APP page, research and development of KYC related pages, project internationalization and package debugging, joining Cordova, ionic, researched bitcore library. 5. The Python version of the CLI development and testing framework is built to create public and private keys and addresses. 6. Organized sidechain white papers and published Chinese and English versions. 7. The Trinity technical solution confirms and determines that the next phase of the goal includes support for a complete demonstration of the H5 DApp, including development, installation, independent operation, and handover. Support wallet and ID management as DApp running in the browser framework, support H5 DApp call Car component. 8. Improve CAR RPC implementation and related documentation. The development of Elastos RPC has been completed and a sample has been submitted. 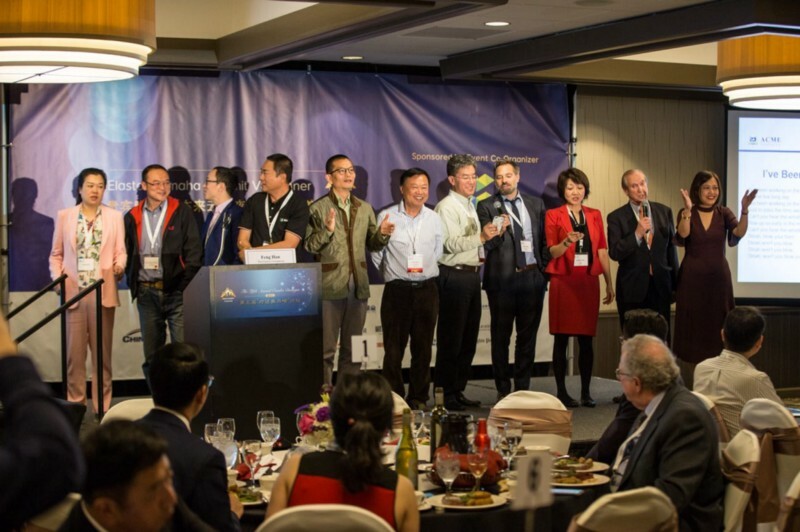 Elastos hosted a VIP Dinner at the Omaha Summit 2018. Rong Chen and Feng Han spoke. More below. Feng Han spoke at the Block Train Expo and explained that future innovation will be in the form of code and programming, protected by the Elastos Virtual Machine and will be tradable as assets over a P2P network on blockchain. Elastos had a meetup for its Shanghai community and it was a big success. More than 50 people attended. 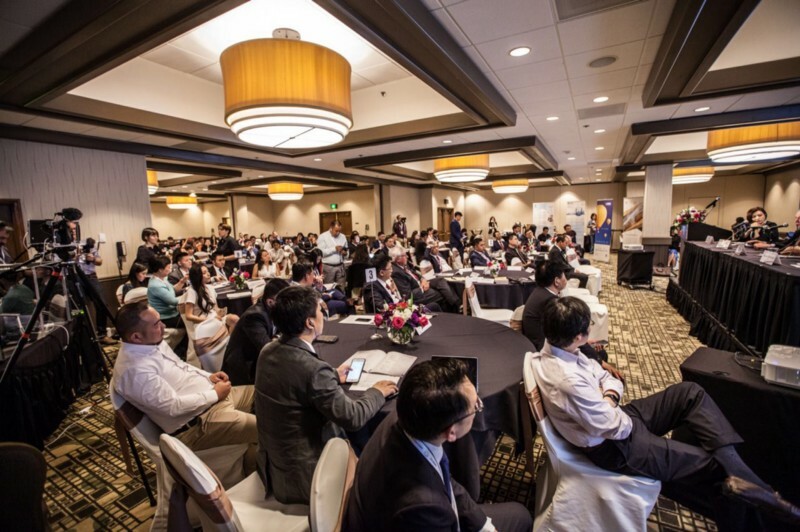 Attendees including Elastos Shanghai team leader Shijun Song, Elastos technical adviser Jingyu Niujing, Microsoft former CTO, StarryMedia founder Weimin Xin, BIT.GAME COO Ding Wang, and BIT.GAME CTO Jinxin Wu shared and explore hot topics such as innovation and breakthrough of blockchain technology, applications and utilities. Elastos Ecology Committee Director Dinghe Hu and Elastos Foundation Secretary Hongjie Hu visited The Chinese Embassy in Washington D.C. to exchanged thoughts with embassy staff on blockchain applications and Elastos. The First Developer Meetup was held in San Francisco. More below. Elastos literally means, “creating virtual machines on demand.” In Amazon’s case, they create virtual machines in the cloud farm, in the server side of the internet. You create tens of thousands of virtual machines on demand versus tens of thousands of hardware machines. Like Amazon clouds, they have two hundred thousand hardware PCs. But then on top of it, you can create half a million virtual on demand or destroy them on demand. That’s what elastic compute means, because it’s done on demand. We have to have matching device drivers. For example, if you have an old Windows 95 printer and you upgrade your OS to 2000, then your machine will ask you to update your driver as well. That’s how the old operating system worked. But if we design the operating system for the Internet, we cannot and should not enforce virtual numbers. There is no way to do that. Let’s say we want to use my phone and this projector next to me together. There’s no way I can enforce that projector to upgrade its driver. If the next speaker has a lower version number, the projector will require to downgrade the version of device driver in order to work. What I’m saying is that for an Internet Operating System there cannot be a virtual name. If there’s no virtual name, then that means the internet will turn into an organic ecosystem. Everything will live and die on its own terms. There is no single point of time saying that everyone needs to upgrade, it is impossible. That is why when we designed an operating system there is no version, meaning that the operating system will last forever. Rong Chen and Kevin Zhang hosted a developer meetup and AMA on May 8. Rong gave a talk and Kevin gave a presentation on the Elastos Bounty Programs. •Elastos Social Bounty Program — ESBP-Social media users and influencers introduce Elastos to social media. •Elastos Referral Bounty Program — ERBP — Reward to members who refer other users, leaders, members to join Elastos community that made significant contribution. This program is about using the entire world to help build the Elastos ecosystem — and it will reward those who do. This fantastic concept will be further addressed in Thoughts and Conclusions. Kevin also announced the hire of two full-time software engineers: Kiran Pachhai (KP Woods) and Clarence Liu. We are extremely pleased to welcome them to the team. There is something…in the air, a current blowing in the winds that whip across the entire globe. A palpable electricity. A levy is about to burst, not a literal one, but a symbolic one that has stopped the river of progress and equality from flowing in far too many areas of our world. Power has always been held by the few, and in all of these areas, the equality of power is now at stake. People are starting to move from centralized power models to decentralized ones. Moving from the few holding all of the power to the many sharing in it. When this dam bursts, or even begins to leak, there will be a mass shift where everyone involved will become more powerful while the most powerful among us will start to becomes less so. That leak has already begun and we are already seeing it happen in certain areas of society. It is the dawning of the new power. This week Rong Chen stopped by the Elastos Telegram group and was greeted much like Mick Jagger at a Rolling Stones concert. While Rong answered many questions about Elastos, one particular statement seemed to, once again, stand out and exemplify his unique leadership style. This statement may not seem revolutionary at first glance, but put into the proper context, one will see that Rong is the definition of the new power. Here is how these two terms are defined. Old power terms are: centralized, exclusive, confidential, institutionalized, traditional corporate style professionalism, non-participatory. New power terms are: decentralized, open sourced collaboration, radically transparent, do-it-yourself crowd culture, very participatory. New power is not political. Both ends of the political spectrum are old power, and both ends are now employing new power tactics. New power merely enables movements to mobilize with technology and decentralize power. New power is already becoming possibly the defining movement of the 21st century thus far. It is a movement that is technology-centric, but is certainly not limited to areas of technology. Instead, its effects span across most areas of human society. Old power has always dominated society and examples can be found everywhere. But as our lives become more technology-driven, new power is being ushered in more and more because interconnectivity is the forerunner to decentralized power. Old power is a top down power model. The top creates, controls, and hoards the power and whatever is left trickles down to everyone else. New power is a sideways power model. Participants or community members co-create their new world together and power moves laterally. The power is shared and our active participation is what generates more power. As we build, we all get stronger, not just the top. Many are starting to believe in what economist and social thinker Jeremy Rifkin has stated for years: that power moving from a hierarchical to a lateral model will be the major factor for creating a sustainable planet on and offline. Let’s take a look at a recent example of an old power model shifting to a new power model, in a place one might not think to look at in this context: the MeToo movement. Harvey Weinstein held such a significant amount of power in Hollywood, that in a 40 year span ending in 2016, he had been thanked at the Oscars 34 times, the same number of times as “God.” He was the definition of old power. Yet when his power began to become decentralized, and his accusers came forward, he had so much stored up, that countless women across the globe were energized and enabled to step into their own power in a way that left reverberations for both men and women everywhere. One of the main reasons that the MeToo movement spread with such speed and intensity is because in a new power system, people are not relying on the old power ways, but purposely rebelling against them, in many cases because the old power is the source of the problem in the first place. In this case, powerful men, protected within their centralized power structure, were able to hold that power and abuse rampantly. They had the control, they got the profits, they could do what they wanted. But when power was shifted, women began speaking out peer-to-peer, not with a centralized leadership, but on consensus, thereby beginning to deflate that old centralized power. The effects were global, massive, and very fast. The fact that the movement was ownerless was what gave it the ability to flourish rapidly. Power was given back to the people of the movement and they became immensely more powerful than the people that kept them silent. This is one example of many movements exposing how centralized power comes all too often with an abuse of it. When movements seek to shift power back to average people, without a third party intermediary, there is a new freedom that circumvents the abuses old power so easily gets away with. Peer-to peer platforms, with decentralized power structures, and the ability for people who were previously powerless to now participate in the distribution of power, are going to continue all over the world and change society. Yes, Facebook likes “sharing” your data, being “open” to making money off of you, and being “connected” to the control of all the power. The Facebooks of the internet were a step in the right direction: an evolution to a new power system but with old power values. But now we need to evolve further to a new power system with new power values. We need someone who can walk the walk with the gait of a tiger. How about something where value is distributed, data is owned, governing is decentralized, the code is open-sourced, and the ecosystem is actually safe? That sounds like the next evolution of new power. It is important to note, though, that not all old power models are bad and not all new ones are good. It’s not binary. In fact, some of the best models to emerge recently employ a combination of the two. The results are always determined by the people involved and their goal for how to use this power. Elastos is one of these hybrids: centralized and decentralized in design, with the goal of an eventual decentralized self-driving sustainable ecosystem. Rong Chen’s world-class expertise in operating systems is very old power (which in this case is exactly what you want) but his vision for his creation is very new power. Turning power over to the crowd will be a major trend and marker of success in the future. We are starting to see it with things like Kickstarter, Lyft, Airbnb, Wikipedia and most notably, blockchain. But to create an entire internet ecosystem that has fixed the enormous security flaws of the old internet, and combines that with the new power values of a new internet, Elastos is at the absolute cutting edge of this shift that has already started to happen. Does any of this sounds familiar yet? If you watched the Developer’s Meetup on Tuesday night, this story is very similar to what Kevin Zhang said he plans to do with the Elastos. He stated that he does not see borders. That we are building the largest workspace in the world. Kevin believes in the crowd wisdom and will not only open up solving Elasots problems to the world, he will pay people in ELA for helping to solve them. We will also be hosting our own hackathons. Kevin is not hoarding the power he has, he does not believe his team is the world, he believes the world is his team. To put it simply, new power models do things differently, and if it’s good enough for the rocket scientists at NASA, then it’s good enough for the rocket scientists at Elastos. In fact, we plan to do a lot of things differently. We are not hoarding profits but will actually pay you to build this world with us. Our bounty program is the picture of bountiful design utilizing the new power. This is the opposite of the current/old model of intended income inequality. People today, especially young people, want to participate and be a part of the world. They want to contribute and have the ability to be compensated accordingly, and the world is full of talented people with a computer who are looking for a way to express what they believe in. Our phones are now gateways to doors, but thus far these doors lead to single worlds of centralized power. But Elastos is a door to many worlds, where universes upon universes could exist one day. In these worlds power is given to people, on people to people exchanges. Think of Elastos as a button on your phone that opens up to a realm where you have a power that you never had before. When you really let yourself imagine this, something happens…a blissful moment drapes over you…an intuitive feeling that you know is right because its makes sense emotionally. It’s a place where you won’t get hacked. Where no one can watch you. Where you can participate in creating value for yourself and the betterment of the world. Elastos is not a utopia — its goal is not unreasonable and unrealistic — it’s simply giving power back — and that’s what makes it powerful. Someday this new power model internet could be exponentially more powerful than the internet currently is. Think of those centralized titans as hoarding our power as their currency. Then think of the floodgates opening and it being distributed out among billions world wide like a current, an electricity that will shock the very system it overturns and in doing so shock the world. This tech, is physical, corporeal — but it is also symbolic, incorporeal, and formless. It represents unity. Instant connection. In physics terms, non-locality. Space and time can no longer separate us — and with Elastos — neither can cyber oligarchs. We are free — to talk, to share, to own, to be safe, to co-create together. We can finally own our internet. This is power. People have forgotten, and many are not even aware, that there is an entire undiscovered landscape of potential on the internet. We have settled for a broken, vulnerable, corporate owned monopoly internet. As if we can only eat at a few chain restaurants at some strip mall, and while we are eating we are being watched by the owners and we may even get robbed. Somehow, this type of internet is what we are addicted to and in awe of. That has to change. We have to build a new internet and extend an invitation to the globe to build it with us. If the Macintosh was a “bicycle for the mind,” then Elastos will be wings for the internet. So let us fly freely, safely, and dazzlingly through the skies above the old power and off into a new world. Let us fly high above the Amazons, and the Googles, and the Facebooks, and high above the hackers and the viruses and the DDoS attacks, and let us look down at the grander picture of what we have accepted as our internet from that view on high, and see just how in need it is of a great overhaul, of a great healing, of a great and new vision of power — because from up there, we can see ourselves like ants marching in lock-step towards our homes at one of the monstrous centralized internet giants on our little hackable highway we call the internet. We have so little of the power in this image, and most of us don’t even know it, like we are merely sleepwalking though our lives online. Here, take my money, take my data, take my privacy, because I need you and your addictive algorithms that give me just enough satisfaction to stay addicted…But from up high, with our new wings, we can see something starting to appear on the horizon with a clarity and a brightness so intense that we know it is the heralding of something better. It’s a place where we are safe and free and power is decentralized. A place where Rong Chen is just like one of us — if not slightly cooler in a Mick Jagger kind of way. While Bill Gates is talking about how he would like to short Bitcoin, Rong Chen has merged mining with it. This is a clear display of the old verses the new. Not to mention that Bill did not believe in Rong’s idea enough to pursue it when he shared it with him in the 90’s, and now Microsoft has dismantled its Windows 10 team while Rong is launching the last OS. This is not to disrespect Microsoft or many who represent the old power, but it shows the dichotomy of the then and the now. Bitcoin is certainly part of the new power, and several other projects in this space. But no other project is fundamentally fixing how we use the internet the way Elastos is. No one else has developed an OS like this. In fact, Rong Chen was riding the winds of the new power all the way back in 2000. Elastos actually precedes Bitcoin and blockchain. While blockchain is a singular manifestation of the new power, Elastos is part of a much bigger context than any mere cryptocurrency. It is a project to make the internet smart, and without it, anything built on top of the internet will only be building on a broken stretch of dark road. While the internet is full of companies who will gladly sell you a matchstick — Elastos is ready to give you a lightbulb. So ask yourself this: who has prepared for this change of power on the internet as much as Rong Chen? Who has known their song so well before they started singing it? Because singing…we shall do. This is not just a weekly report, this is a song, and we are singing. Singing the gospel, not of a man, but of a vision of a new internet that we all share, that we all build together. Now can I get an Amen?! Rong Chen is the new power. Kevin Zhang is the new power. Fay Li is the new power. They are not our bosses, they are not self-important, they are not going to control us and take all of the profits for themselves. But they just might be prophets of what is to come on this new internet where we have leaders but they do not lead us. We lead ourselves. We will take the internet from the clutches of the greedy and the possessive and the unwilling to share — and we will share it. Because we are the new power. We’re not making a device, or a centralized platform, we’re making a world. A world of liberty and opportunity that is safe and can encompass other projects within our spheric embrace. Other blockchains can actually join our ecosystem, not compete with it, thus growing this new internet into a colossus of new power. We are all building it — and they will all come.